Version A: Gather as many performers as possible All performers wear a T-shirt with fragments of scores printed or written on it. The score can be newly composed, or can be a transcription of a found score. No clef signs should be used to allow maximum flexibility for available instruments. Prepare two special T-shirts with barlines for the beginning and ending of the piece. Each performer starts playing after s/he sees the T-shirt with the beginning barline. During the performance, the performers must constantly move around and play whatever fragment of score (on the T-shirts of other performers) that they see. They each stop playing when they see the T-shirt with the final barline. The performer with the final barline T-shirt may choose to hide from other performers for as long as s/he wants. 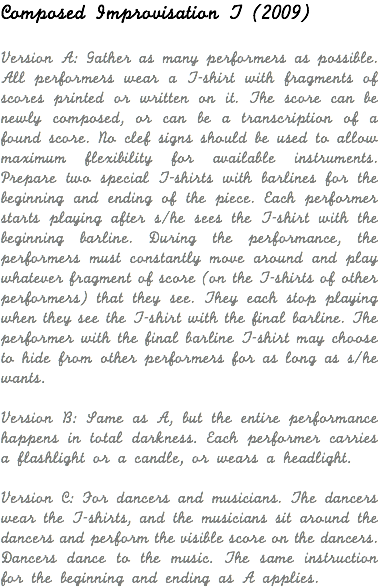 Version B: Same as A, but the entire performance happens in total darkness. Each performer carries a flashlight or a candle, or wears a headlight. Version C: For dancers and musicians. The dancers wear the T-shirts, and the musicians sit around the dancers and perform the visible score on the dancers. Dancers dance to the music.